This week I'm sharing my final die from the July Release. This is a beautiful die that reflects the true celebration of Christmas! There are so many ways to use it on a project. and then use fun and festive colors to show it off! Doesn't that bright green make it pop? I simply traced around the die with a pencil, and cut it out. After that, it was just some simple paper layering. Finally, I added some rhinestones and a ribbon bow. 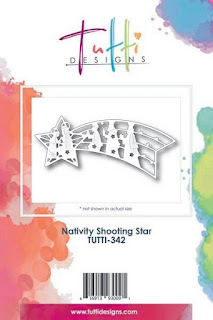 Love your traditional Christmas colors and your design really makes this die cut POP! Beautiful card! That die is certainly the star of the show! I adore that beautiful plaid Designer Paper too! Fabulous design! Wonderful holiday card! I have that die cut also and you gave me some very different ideas of what to do with it!